THE FUTURE IS now, according to industry chatter at the 35th annual Licensing Expo, which took place in Las Vegas June 9-11. Looking ahead, licensing execs confirmed the continuing importance of digital platforms as a showcase for new and existing brands. One example? AwesomenessTV, a teen- focused YouTube channel, recently started a consumer products division to capitalize on merchandising concepts inspired by its roster of teen TV stars. A sign of the property’s potential, Kohl’s S.o.R.a.d junior line, which was designed with input from the stars of AwesomenessTV and released last fall, has generated strong sales, in-store traffic and thousands of social media hits. For the younger set, Amazon Studios (which develops feature films and episodic series for the retail behemoth) touted its original programming, including its award- winning shows Annedroids, Tumble Leaf, and Wishenpoof. And Netflix, another popular streaming service giving traditional TV a run for its money, announced that Masha and the Bear, a popular Russian pre-school production, will be available in late summer. 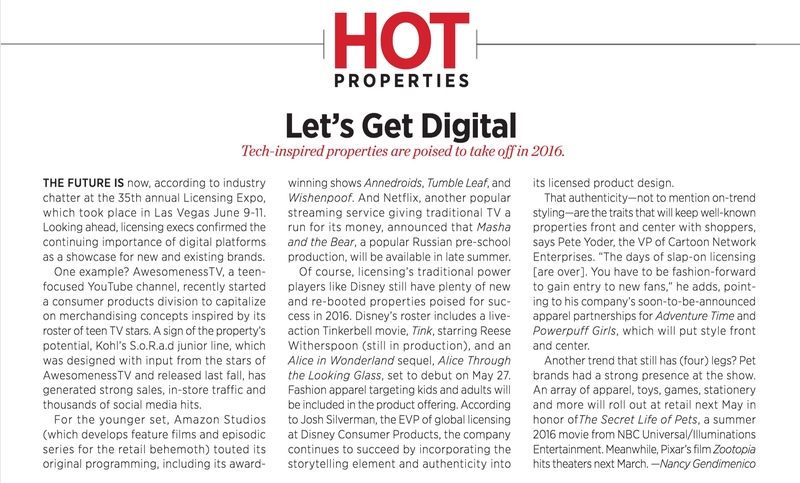 Of course, licensing’s traditional power players like Disney still have plenty of new and re-booted properties poised for suc- cess in 2016. Disney’s roster includes a live- action Tinkerbell movie, Tink, starring Reese Witherspoon (still in production), and an Alice in Wonderland sequel, Alice Through the Looking Glass, set to debut on May 27. 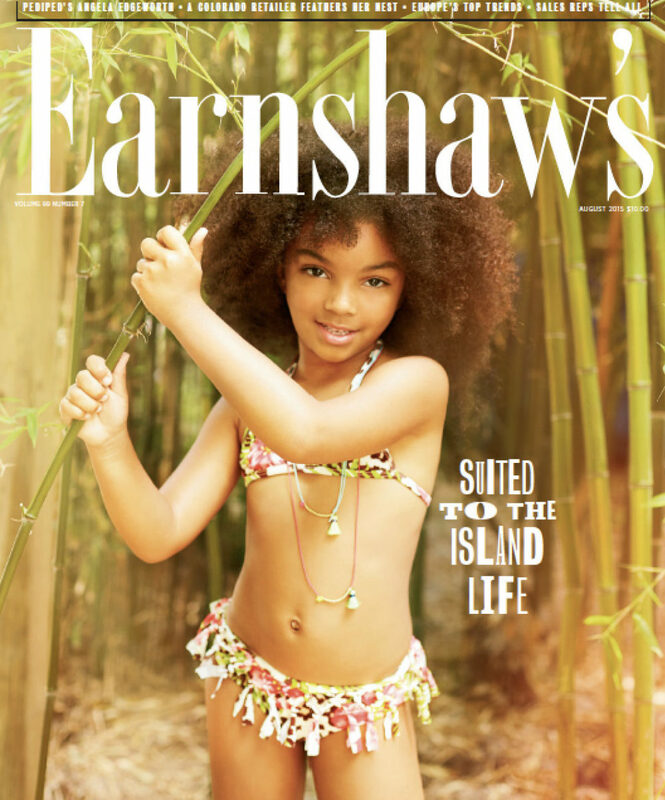 Fashion apparel targeting kids and adults will be included in the product offering. According to Josh Silverman, the EVP of global licensing at Disney Consumer Products, the company continues to succeed by incorporating the storytelling element and authenticity into its licensed product design. That authenticity—not to mention on-trend styling—are the traits that will keep well-known properties front and center with shoppers, says Pete Yoder, the VP of Cartoon Network Enterprises. “The days of slap-on licensing [are over]. You have to be fashion-forward to gain entry to new fans,” he adds, point- ing to his company’s soon-to-be-announced apparel partnerships for Adventure Time and Powerpuff Girls, which will put style front and center. 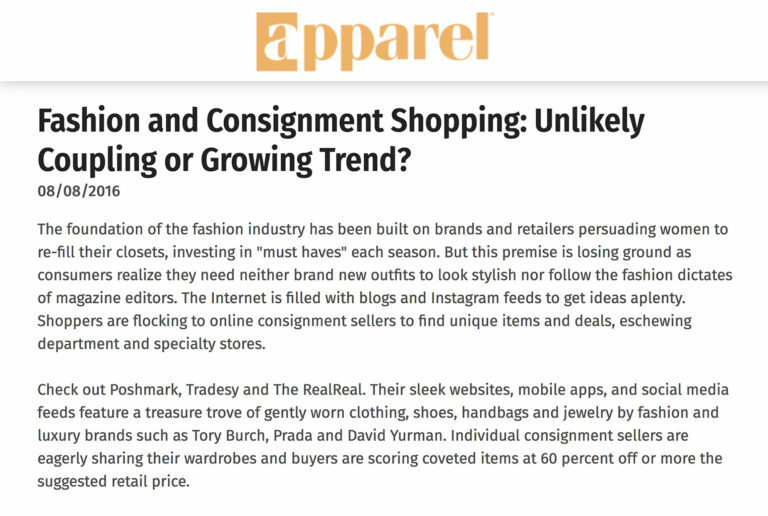 "Fashion and Consignment Shopping: Unlikely Coupling or Growing Trend?"